Orbital cellulitis and preseptal cellulitis are the major infections of the ocular adnexal and orbital tissues. Orbital cellulitis is an infection of the soft tissues of the orbit posterior to the orbital septum. Preseptal cellulitis is an infection of the soft tissue of the eyelids and periocular region anterior to the orbital septum. (See Presentation.) Orbital cellulitis and preseptal cellulitis can sometimes be a continuum. 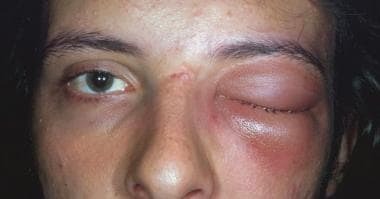 A male patient with orbital cellulitis with proptosis, ophthalmoplegia, and edema and erythema of the eyelids. The patient also exhibited pain on eye movement, fever, headache, and malaise. A male patient with orbital cellulitis who demonstrated proptosis, ophthalmoplegia, and edema and erythema of the eyelids. The patient also exhibited chemosis and resistance to retropulsion of the globe. The orbital septum is a layer of fascia extending vertically from the periosteum of the orbital rim to the levator aponeurosis in the upper eyelid and to the inferior border of the tarsal plate in the lower eyelid. Orbital cellulitis is commonly associated with sinus infection and can be caused by direct extension of infection from the globe, eyelids, ocular adnexum, and other periocular tissues. Orbital cellulitis may follow dacryocystitis, osteomyelitis of the orbital bones, phlebitis of the facial veins, and dental infections. Orbital cellulitis is caused most commonly in all age groups by ethmoid sinusitis, accounting for more than 90% of all cases; aerobic, non-spore–forming bacteria are the organisms that are most frequently responsible. The process involves edema of the sinus mucosa, which leads to narrowing of the ostia and subsequent reduction or cessation of normal sinus drainage. Microflora indigenous to the sinuses and upper respiratory tract proliferate and invade the edematous mucosa, resulting in suppuration. It is enhanced by the reduced oxygen tension within the obstructed sinus cavity. The organisms gain access to the orbit through thin bones of the orbital walls, venous channels, foramina, and dehiscences. Then, subperiorbital and intraorbital abscesses may occur. The resulting elevation of intraorbital pressure results in the typical signs of proptosis, ophthalmoplegia, and chemosis. Orbital cellulitis resulting from infection of the maxillary sinus secondary to dental infections can be caused by microorganisms indigenous to the mouth, including anaerobes, commonly Bacteroides species. Those cases stemming from dacryocystitis most commonly are caused by S aureus, S pneumoniae, Streptococcus pyogenes, and nontypeable H influenzae. Infections spreading from the soft tissues of the eyelids and face are due most commonly to staphylococci and S pyogenes. The initial antibiotic regimen can be modified if the response is inadequate or if the cultures dictate otherwise. Infectious material may be introduced into the orbit directly through accidental (eg, orbital fracture) or surgical trauma. Indeed, orbital cellulitis may be caused by any injury perforating the orbital septum. Orbital inflammation  may be noted within 48-72 hours after injury, or, in the case of a retained orbital foreign body, it may be delayed for several months. Surgical procedures, including orbital decompression, dacryocystorhinostomy, eyelid surgery,  strabismus surgery, retinal surgery, and intraocular surgery, have been reported as the precipitating cause of orbital cellulitis. Postoperative endophthalmitis can extend to the orbital soft tissues. Streptococcus species, Staphylococcus aureus, and Haemophilus influenzae type B are the most common bacterial causes of orbital cellulitis. Pseudomonas, Klebsiella, Eikenella, and Enterococcus are less common culprits. Polymicrobial infections with aerobic and anaerobic bacteria are more common in patients aged 16 years or older. Fungal causes of orbital cellulitis are most commonly Mucor and Aspergillus species. Fungi can enter the orbit. Orbital cellulitis due to fungal infections carries a high mortality rate in patients who are immunosuppressed. Zygomycosis (also known as mucormycosis or phycomycosis) [4, 5, 6] has a wide distribution, while aspergillosis more commonly is seen in warm, humid climates. Mucormycosis can cause rapid-onset thrombosing vasculitis (1-7 days), while some forms of aspergillosis can be chronic and indolent (months to years). Aspergillosis initially results in chronic proptosis and decreased vision, while mucormycosis gives rise to the orbital apex syndrome (involving cranial nerves II, III, IV, V-1, and VI, and orbital sympathetics). More commonly, mucormycosis presents with pain, lid edema, proptosis, and visual loss. While aspergillosis and mucormycosis may each result in nasal and palatal necrosis, mucormycosis also may lead to thrombosing arteritis and ischemic necrosis, while aspergillosis gives rise to chronic fibrosis and a nonnecrotizing granulomatous process. The medial orbital wall is thin and is perforated not only by numerous valveless blood vessels and nerves but also by numerous defects (lamina papyracea/Zuckerkandl dehiscences). This combination of thin bone, foramina for neurovascular passage, and naturally occurring defects in the bone allows for easy communication of infectious material between the ethmoidal air cells and the subperiorbital space in the medial aspect of the orbit. The most common location of a subperiorbital abscess is along the medial orbital wall. The periorbita is adherent relatively loosely to the bone of the medial orbital wall, which allows abscess material to easily move laterally, superiorly, and inferiorly within the subperiorbital space. In addition, the lateral extensions of the sheaths of the extraocular muscles, the intermuscular septa, extend from one rectus muscle to the next and from the insertions of the muscles to their origins at the annulus of Zinn, posteriorly. Posteriorly in the orbit, the fascia between the rectus muscles is thin and often incomplete, allowing easy extension between the extraconal and intraconal orbital spaces. Venous drainage from the middle third of the face, including the paranasal sinuses, is mainly via the orbital veins, which are without valves, allowing the passage of infection anterograde and retrograde. An increased incidence of orbital cellulitis occurs in the winter nationally and internationally, because of the increased incidence of sinusitis in cold weather. In children, orbital cellulitis has been reported as twice as common in males as in females. In adults, however, no difference in the frequency of orbital cellulitis exists between the sexes, except for cases caused by methicillin-resistant Saureus, which are more common in females than in males by a ratio of 4:1. Orbital cellulitis, in general, is more common in children than in adults. The median age range of children hospitalized with orbital cellulitis is 7-12 years. Prior to the availability of antibiotics, patients with orbital cellulitis had a mortality rate of 17%, and 20% of survivors were blind in the affected eye. As a result of prompt diagnosis and the appropriate use of antibiotics, however, this rate has been reduced significantly, although blindness still occurs in up to 11% of cases. Orbital cellulitis due to methicillin-resistant S aureus can lead to blindness despite antibiotic treatment. Orbital cellulitis can result in orbital and intracranial complications. Subperiosteal or orbital abscess formation may occur (7-9%), while permanent vision loss may result from corneal damage secondary to exposure or neurotrophic keratitis, destruction of intraocular tissues, secondary glaucoma, optic neuritis, or central retinal artery occlusion. Blindness also may occur secondary to elevated intraorbital pressure or the direct extension of infection to the optic nerve from the sphenoid sinus. Direct involvement of the ocular motor nerves or the extraocular muscles may lead to decreased ocular motility. Intracranial complications include meningitis (2%), cavernous sinus thrombosis (1%), and intracranial, epidural, or subdural abscess formation. Cavernous sinus thrombosis has a mortality rate of 50% or higher, but it has become relatively rare in industrialized countries with proper treatment. Cavernous sinus thrombosis should be considered in any patient with orbital cellulitis and should be suspected in the presence of rapid progression of the clinical signs (eg, increasing proptosis, mydriasis, dilation of retinal veins, decreasing visual acuity, development of an afferent pupillary defect). Intracranial abscess formation is suggested by altered consciousness, signs of central nervous system disturbance, persistent fever despite adequate antibiotic therapy, and resolution of the sinusitis and orbital cellulitis components of the disease. Anari S, Karagama YG, Fulton B, et al. Neonatal disseminated methicillin-resistant Staphylococcus aureus presenting as orbital cellulitis. J Laryngol Otol. 2005 Jan. 119(1):64-7. [Medline]. Bergin DJ, Wright JE. Orbital cellulitis. Br J Ophthalmol. 1986 Mar. 70(3):174-8. [Medline]. Blomquist PH. Methicillin-resistant Staphylococcus aureus infections of the eye and orbit (an American Ophthalmological Society thesis). Trans Am Ophthalmol Soc. 2006. 104:322-45. [Medline]. Boden JH, Ainbinder DJ. Methicillin-resistant ascending facial and orbital cellulitis in an operation Iraqi Freedom troop population. Ophthal Plast Reconstr Surg. 2007 Sep-Oct. 23(5):397-9. [Medline]. Bullock JD, Fleishman JA. Orbital cellulitis following dental extraction. Trans Am Ophthalmol Soc. 1984. 82:111-33. [Medline]. Chiu ES, Capel B, Press R, et al. Successful management of orbital cellulitis and temporary visual loss after blepharoplasty. Plast Reconstr Surg. 2006 Sep. 118(3):67e-72e. [Medline]. Denning DW, Stevens DA. Antifungal and surgical treatment of invasive aspergillosis: review of 2,121 published cases. Rev Infect Dis. 1990 Nov-Dec. 12(6):1147-201. [Medline]. Dortzbach RK, Segrest DR. Orbital aspergillosis. Ophthalmic Surg. 1983 Mar. 14(3):240-4. [Medline]. Doxanas MT, Anderson RL. Clinical Orbital Anatomy. Baltimore, Md: Williams & Wilkins. 1984. Emmett Hurley P, Harris GJ. Subperiosteal abscess of the orbit: duration of intravenous antibiotic therapy in nonsurgical cases. Ophthal Plast Reconstr Surg. 2012 Jan. 28(1):22-6. [Medline]. Ferry AP, Abedi S. Diagnosis and management of rhino-orbitocerebral mucormycosis (phycomycosis). A report of 16 personally observed cases. Ophthalmology. 1983 Sep. 90(9):1096-104. [Medline]. Garcia GH, Harris GJ. Criteria for nonsurgical management of subperiosteal abscess of the orbit: analysis of outcomes 1988-1998. Ophthalmology. 2000 Aug. 107(8):1454-6; discussion 1457-8. [Medline]. Gass JD. Ocular manifestations of acute mucormycosis. Arch Ophthalmol. 1961 Feb. 65:226-37. [Medline]. Grimes D, Fan K, Huppa C. Case report: dental infection leading to orbital cellulitis. Dent Update. 2006 May. 33(4):217-8, 220. [Medline]. van der Poel NA, de Witt KD, van den Berg R, de Win MM, Mourits MP. Impact of superior ophthalmic vein thrombosis: a case series and literature review. Orbit. 2018 Jul 24. 1-7. [Medline]. Lindsay RA, Weiss AH, Kelly JP, Anderson VC, Lindsay TH, Cabrera MT. Clinical Outcomes in Children With Orbital Cellulitis and Radiographic Globe Tenting. Ophthalmic Plast Reconstr Surg. 2018 Jul/Aug. 34 (4):329-332. [Medline]. Harris GJ. Subperiosteal abscess of the orbit. Arch Ophthalmol. 1983 May. 101(5):751-7. [Medline]. Harris GJ. Subperiosteal inflammation of the orbit. A bacteriological analysis of 17 cases. Arch Ophthalmol. 1988 Jul. 106(7):947-52. [Medline]. Liao JC, Harris GJ. Subperiosteal abscess of the orbit: evolving pathogens and the therapeutic protocol. Ophthalmology. 2015 Mar. 122 (3):639-47. [Medline]. Harris GJ, Will BR. Orbital aspergillosis. Conservative debridement and local amphotericin irrigation. Ophthal Plast Reconstr Surg. 1989. 5(3):207-11. [Medline]. Hollsten J, Hollsten D, Green, MK. Orbital community-acquired methicillin-resistant Staphylococcus aureus infections: the range of presentation, increasing prevalence and efficacy of treatment. Poster at Fall Scientific Symposium, American Society of Ophthalmic Plastic and Reconstructive Surgery. Nov 2008. Chen L, Silverman N, Wu A, Shinder R. Intravenous Steroids With Antibiotics on Admission for Children With Orbital Cellulitis. Ophthal Plast Reconstr Surg. 2017 Mar 31. [Medline]. Hornblass A, Herschorn BJ, Stern K, et al. Orbital abscess. Surv Ophthalmol. 1984 Nov-Dec. 29(3):169-78. [Medline]. Jackson K, Baker SR. Clinical implications of orbital cellulitis. Laryngoscope. 1986 May. 96(5):568-74. [Medline]. Jones DB, Steinkuller PG. Strategies for the initial management of acute preseptal and orbital cellulitis. Trans Am Ophthalmol Soc. 1988. 86:94-108; discussion 108-12. [Medline]. Jordan DR, St Onge P, Anderson RL, et al. Complications associated with alloplastic implants used in orbital fracture repair. Ophthalmology. 1992 Oct. 99(10):1600-8. [Medline]. Kloek CE, Rubin PA. Role of inflammation in orbital cellulitis. Int Ophthalmol Clin. 2006 Spring. 46(2):57-68. [Medline]. Koornneef L. Orbital septa: anatomy and function. Ophthalmology. 1979 May. 86(5):876-80. [Medline]. Lemke BN, Gonnering RS, Weinstein JM. Orbital cellulitis with periosteal elevation. Ophthal Plast Reconstr Surg. 1987. 3(1):1-7. [Medline]. Mauriello JA Jr, Hargrave S, Yee S, et al. 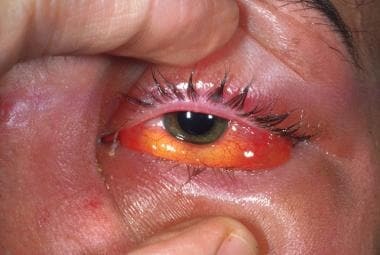 Infection after insertion of alloplastic orbital floor implants. Am J Ophthalmol. 1994 Feb 15. 117(2):246-52. [Medline]. McKinley SH, Yen MT, Miller AM, et al. Microbiology of pediatric orbital cellulitis. Am J Ophthalmol. 2007 Oct. 144(4):497-501. [Medline]. Rutar T, Chambers HF, Crawford JB, et al. Ophthalmic manifestations of infections caused by the USA300 clone of community-associated methicillin-resistant Staphylococcus aureus. Ophthalmology. 2006 Aug. 113(8):1455-62. [Medline]. Rutar T, Zwick OM, Cockerham KP, et al. Bilateral blindness from orbital cellulitis caused by community-acquired methicillin-resistant Staphylococcus aureus. Am J Ophthalmol. 2005 Oct. 140(4):740-2. [Medline]. Schramm VL Jr, Curtin HD, Kennerdell JS. Evaluation of orbital cellulitis and results of treatment. Laryngoscope. 1982 Jul. 92(7 Pt 1):732-8. [Medline]. Shields JA, Shields CL, Suvarnamani C, et al. Retinoblastoma manifesting as orbital cellulitis. Am J Ophthalmol. 1991 Oct 15. 112(4):442-9. [Medline]. Sridhara SR, Paragache G, Panda NK, et al. Mucormycosis in immunocompetent individuals: an increasing trend. J Otolaryngol. 2005 Dec. 34(6):402-6. [Medline]. Steinkuller PG, Jones DB. Microbial preseptal and orbital cellulitis. Tasman W, ed. Clinical Ophthalmology. Philadelphia, Pa: Lippincott, Williams & Wilkins; 1999. 1-8, 17-29, Chap 25. Vayalumkal JV, Jadavji T. Children hospitalized with skin and soft tissue infections: a guide to antibacterial selection and treatment. Paediatr Drugs. 2006. 8(2):99-111. [Medline]. Westley GJ, Mazur JM, Sifton DW, eds. Physicians' Desk Reference. Montvale, NJ: Medical Economics Co; 1998. Vol 52: 2081, 2145. Yen MT, Yen KG. Effect of corticosteroids in the acute management of pediatric orbital cellulitis with subperiosteal abscess. Ophthal Plast Reconstr Surg. 2005 Sep. 21(5):363-6; discussion 366-7. [Medline]. Kobayashi D, Givner LB, Yeatts RP, Anthony EY, Shetty AK. Infantile orbital cellulitis secondary to community-associated methicillin-resistant Staphylococcus aureus. J AAPOS. 2011 Apr. 15 (2):208-10. [Medline]. Seltz LB, Smith J, Durairaj VD, Enzenauer R, Todd J. Microbiology and antibiotic management of orbital cellulitis. Pediatrics. 2011 Mar. 127 (3):e566-72. [Medline].